I’m not entirely sure what to make of today’s post, but third time’s the charm, so I decided to share some of the strange goings on with portals, energies and falling doors at Faery Hof. The synchronicities have been over the top, as have the recent collective energies, which we are all processing in our own ways. I know David and I are in a period of major shift as we wind up our time in Goshen, and I know these painted portal doors are powerful. They always work, often very fast, and are coded for specific results as well as the highest good of all involved, not just human-centric. 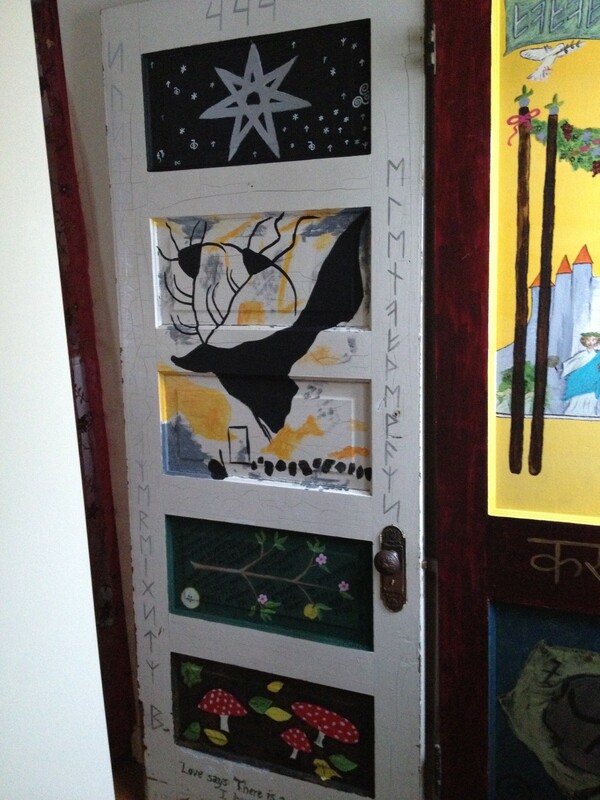 Each door contains a personal prayer, as well as a collective offering. I’ve had some of them for nearly seven years, but I painted most in 2010, during my nine months in my ninth floor tower apartment two blocks from Lake Michigan in Hyde Park, Chicago after my divorce and subsequent return to the Midwest following a nine year stint moving around the most beautiful locations of the Pacific Northwest, Southwest, and Northern and Central California. Yes, lots of nines! Landing in that apartment was its own layered and seemingly destined event. If interested, you can read about my Chicago Moving Story and the Mother Lode of Doors here, but it’s enough to know about the nines and that the apartment I was directly led to by dreams, intuitive instructions and synchronicity just happened to be right under an attic full of doors that had been waiting there for five years per the new building owners’ instructions that their purpose would someday reveal itself. I recently mentioned how I’m in a nine year on multiple levels of my astrological chart, nine being the number of the Hermit. Nine also features prominently in our address, but I won’t post those details here. In addition to the Hermit, nine is associated with Odin’s nine nights on the tree, as described in Odin’s Rune Song, which details how he hung on “the windswept tree” for “nine full nights,” sacrificing himself to himself until he noticed the Runes scattered below him. From his fasting, solitude and upside down perspective, he suddenly made sense of the Runes, spontaneously understanding them and claiming their wisdom and powerful energy as his own. Anyway, there’s some background on the doors. They’re powerful, intriguing to visitors and blog readers, and they’ve done their job, usually with powerful synchronicities and changes. Until recently, though, they’ve existed in the background. They haven’t moved of their own accord, and I always considered them symbolic doors, painted spells, and/or energy portals to preferred realities. I don’t know if it’s the potent energies of 2016, the increased energies emanating from my garden, or an amplification of major inner transformation literally moving solid reality, but recently, these doors have begun to move. The door you see to the right is the one in front of our steps. In order to “fly” into the white door — designed as a portal into Faerie, as well as a prayer for “sustainable sovereignty” in our world –I was somehow carried and turned so that I landed by body slamming the door almost as though walking through the doorway, but it was solid. Miraculously, I received no injuries. I had just been wondering, “Where will we move when we’re finally done our time in Goshen?” I know I’ve got a contract with this land, and David and I had earlier been discussing how I might as well just continue to dive into the gardens here until I’ve completed the transformation. I had forgotten a message from 2014 that I am opening a faery portal here with all the land healing, flowers, trees and sacred work I do on these two yards. Around the same time, I received a vision of David and me as very, very old people, sitting happily by a fire in what feels like Ireland but might be the actual faery realm. This has remained a steady vision of mine for years now, popping up when least expected, but I wasn’t thinking about it at all [that night]. Anyway, after asking that question, I floated/body slammed into a faery door with the address at the top of 444. Again, no damage to me or the door, but it certainly caught my attention! Tania and I had been texting about intensities happening with her beloved and magical rabbit companion, who was very ill, and we sensed very close to transitioning. The falling portal door seemed like the end of an era, but also the opening on a new one. Joy passed the next day. 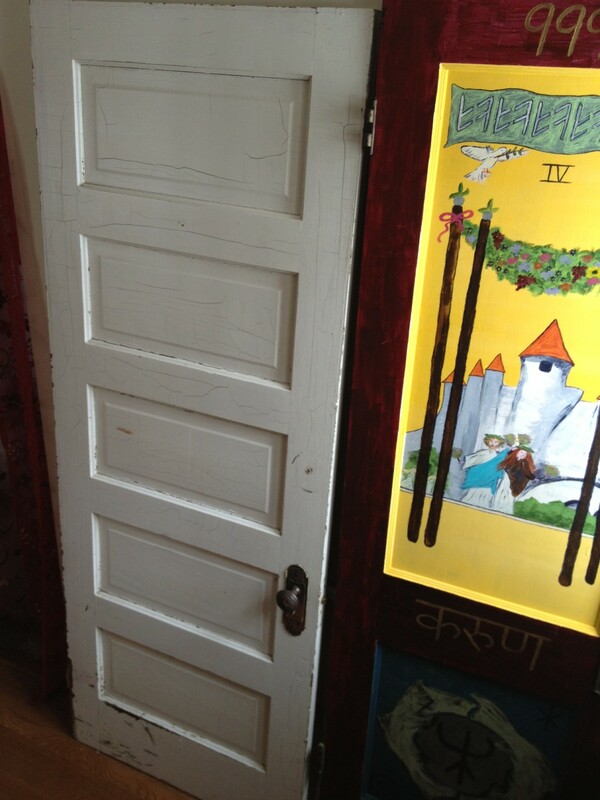 In addition to the Full Moon on Solstice and the potency surrounding Joy’s shift, which revealed enormous growth and peace for Tania, I found it interesting that this door crashed down/”broke on through to the OtherSide” right after I had been doing some massive work around a pivotal event in my childhood. Synchronously, my mom’s house –the house where this still not fully understood cosmic, future setting event happened –also sold right at Solstice. The quote on the front of the door reads, “There is always one moment in childhood when the door opens and lets the future in.” ~ Graham Green. 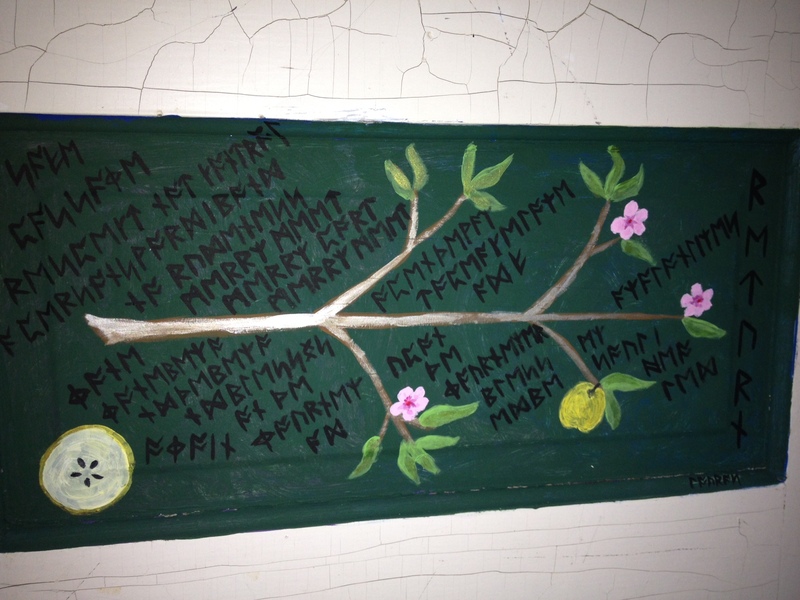 The back of the door, revealed by the fall, features … Odin’s Rune Song! (Yes, all those nines are still at it … and the 1111 door fell at 8:11 or 9:11. I honestly cannot remember which at this time. Either way, we have an 1111 door falling at the 11th minute and if 9:11, then we have another 11 when we add the digits.) The back of the door also has some Hebrew on it, which I don’t recall painting, but which an Orthodox Jewish friend of mine traced to a VERY obscure announcement of liberation. The bottom panel has a chant to the Goddess in her many forms. Note the 222 address, as well as the fact that this door got a January 2015 update of the red panel that now reads “Gaia” and includes the Celtic symbols “Wheel of Being” and “Destiny Knot” that represent harmony and a reweaving of destiny. The bottom quote reads: “Between God and the soul, there is no between.” ~ Julian of Norwich. As gruesome as that looks, I feel no pain in my arm unless someone really pushes the bruise. Despite my yank of the mysteriously caught blanket, the door seemed to fall in slow motion. I definitely felt it land, as the bruise reveals; however, like other experiences of my life that could have (by all rational accounts should have) resulted in very serious injury, this falling door did not crash anywhere near as hard as it could have. After waking David to help me lift it off me (it did not even make a noise as it “crashed”), I went downstairs to get some homeopathic arnica to take internally along with the external gel I had already applied. The clock downstairs read 2:22. So, here we have a third odd experience with a door, followed by seeing the door’s address echoed in the next glance at a clock. According to Doreen Virtue’s Angel Numbers 101, angel message of 222 means “Trust that everything is working out exactly as it’s supposed to, with Divine blessings for everyone involved. Let go and have faith.” Um, okay, then! All those things I’ve set in motion and sensed moving behind the scenes — are apparently moving. Also interesting is that as soon as the door fell and while I waited for David to wake up, I began hearing the mantra painted on the back of the door ~ a mantra invoking “the divine manifestations of the sacred union of masculine and feminine properties.”David and I have been experiencing positive recalibrations of many things in recent months, including a deeper balance and strengthening of the masculine and feminine qualities in ourselves and with each other. I know others — including my faery twin soul sister Tania and her Dave — who have felt the same uptick in mutual creation, focus, support, shared experiences, partnership and manifestation. As with the story of my first “fall” into the 444 door, followed by seeing 4:44 on the clock and then having over the top synchronicities directly involving and mentioning portal doors, yesterday, David and I just happened to watch “The Adjustment Bureau,” a movie that just happens to feature main character named “David,” major synchronicities, deepening love, and … portal doors! All I can say is that the doors have my attention. I will continue to take seriously the “Gatekeeper” and “Invitation to Faery” cards I keep pulling from Wild Wisdom of the Faery Oracle, both about portals, and I will continue to listen to the Four of Swords card (need for meditation/retreat) and the Moon (intuition, “stay on your path for safety”) cards I frequently pull from the Tarot. “The Adjustment Bureau” offers a great deal of insight into the concepts of Destiny, path, free will, portals and the ability of Love to alter reality. Plenty to continue pondering in my nine year at Faery Hof, Haus Am See and the gardens. Happy Full Moon, Blessed Be … and be the blessing! I’ve been having one of those days already, and it’s just 7:22 a.m.! Due to a combination of yesterday’s late afternoon chocolate, a hot upstairs, new fan and the sudden absence of our heavy comforter, I had trouble falling asleep last night. My intuition was screaming at me to use that excuse to read the Kindle version of Sharon Blackie’s “If Women Rose Rooted,” since I had downloaded it in Pennsylvania but not had a chance yet to begin reading it. My Kindle sat on the floor next to the bed taunting me all night, but for some reason, I refused to give up on sleep and read. At one point, after about my fifth bathroom break, fan fiddle, and prowl around the upstairs, I decided to go downstairs, still sans Kindle, and turn the full house fan on with just a few minutes of AC. We have super steep steps here — Dutch steps, as David and his dad call them. They have new hardwood directly over the original steps of this gut rehab, because to change the steps at all would have meant needing to bring them up to code, much less steep and a complete change to the house’s original layout.This stairwell has long given me visions of radical falls, and so I always hold the railing on the way down. When Tania Marie visited last year, she tumbled down the last third of the steps while I was outside in the garden, but thanks to some kind of faery intervention, Reiki and both topical and oral arnica, my sweet friend who has a history of foot fractures didn’t even bruise. I experienced a similar situation last night on my way downstairs. Despite holding onto the railing and being catlike in my abilities to move through the dark, somehow, last night, I misjudged where the floor should be, skipping the final two steps. I had just been wondering, “Where will we move when we’re finally done our time in Goshen?” I know I’ve got a contract with this land, and David and I had earlier been discussing how I might as well just continue to dive into the gardens here until I’ve completed the transformation. I had forgotten a message from 2014 that I am opening a faery portal here with all the land healing, flowers, trees and sacred work I do on these two yards. Around the same time, I received a vision of David and me as very, very old people, sitting happily by a fire in what feels like Ireland but might be the actual faery realm. This has remained a steady vision of mine for years now, popping up when least expected, but I wasn’t thinking about it at all last night. There I was, hot, insomniac, listening to trains from across town blow their horns far away even though ours were silent … feeling far too vata with all that wind blowing from an air purifier and our new fan, wondering wherever will we move when I’m finally finished here. Before bed, I had just ordered a small frog birdbath/fountain and David Phlox, along with other white flowers for a watery moon garden in the Haus Am See’s backyard. Frustrated with my inability to sleep but for some reason not reading “If Women Rose Rooted,” I made my way downstairs, miscalculated the bottom and literally flew into Door Number 17 — “Elen of the Ways,” which is itself a faery portal, complete with faery star on top. David got up, and I decided to try to go back to sleep, but that “If Women Rose Rooted” book kept calling to me, so I finally picked up my Kindle and began reading all about Boudica and strong women of the Celtic Tradition — about the power of the land and the importance of women reconnecting with the land. It’s a delightful, enchanting book so far, but reading about Boudica reminded me of Marion Zimmer Bradley’s “Ravens of Avalon,” which tells the story of Boudica, when then reminded me of “Priestess of Avalon,” which draws upon legends of Elen of the Ways. Too many syncs before breakfast! This woman was rising rooted and reading her Celtic Devotional for the day. What did I find? A passage about soul kinship, which had me again pondering our next location and David and me talking about Irish people in both South Bend and Pennsylvania. I decided to pull a Wild Wisdom of the Faery Oracle Card, and pulled “Secret Doorway,” which pictures a half-woman, half-fae being approaching … a faery portal! Stunned, I ran to Door Number 17, marveling at my unharmed crash into that faery portal last night. When David’s alarm went off this morning, I said, “Well, I’m still here. 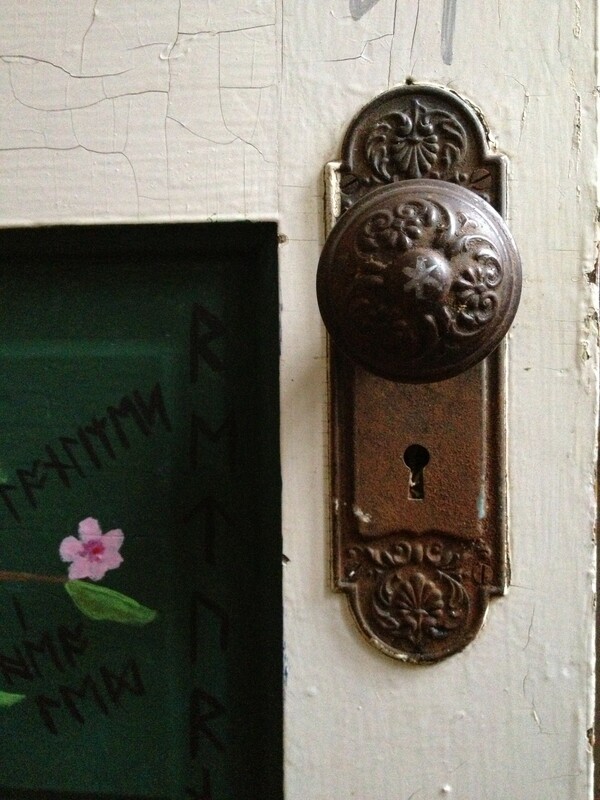 I fell down the steps and crashed into the faery portal, but I guess it wasn’t time yet.” As I looked at the door, I noticed the 444 and remembered my waking moment this morning. Of all the things I wanted to do in Penn’s Woods on our visit there, taking David to my old haunts in Monocacy Park was on top of my list. We finally got a few hours to ourselves the afternoon before my father passed away. As we wandered by Monocacy Creek, I felt the presence of the Fae, so imagine our delight to find this faery door just off the path! David snapped a photo as I approached the door, and yes, it does remind me of the Secret Doorway card. … and be the blessing! My latest portal door is a commissioned piece, which I almost turned down due to all the other projects on docket for completion this winter. But dreams, visions and a Wisdom of Avalon Oracle card indicated in no uncertain terms that this 8 x 10″ small, yet mighty portal did intend to come through in the not-too-distant future. As much as my rational mind said, “Laura, you’ve already got an overfull plate. The last thing you need is another project this winter,” a greater sense of gentle timing and rightness whispered, “Yes, do this, and do it well.” The portal commissioner and I made arrangements back in December 2015; however, I let her know I’d need to wait until at least mid-January to begin painting, since we had so many holiday travels and guests, and I wanted to finish my Permaculture Design Course first. We agreed that the “door” would determine its own timing, and I continued to plug and plug away at my 72-hour certification course, plus an unusually high volume of phone sessions. Typical me, I had somehow convinced myself that I could finish a 72-hour course in 12 hours, and so I found the lessons and homework taking much, much longer than anticipated. Fancy that! I’ve learned so much and really intended to finish the final project before beginning this portal, but about 1/3 of the way through my final project, after numerous delays, I suddenly felt the time had come to paint this portal. In retrospect, everything occurred in perfect timing, as several major astrological events and the cross quarter day of Imbolc played key roles in discerning the overall design.In fact, not one, but two distinct portals came through so strongly that I needed to check with my client to see which one felt like her portal. I know from past experience that sometimes a future door hijacks the one I’m working on, as happened when Door Number 6: Freya and Frigga inserted itself ahead of The Lovers door I thought I was about to paint. It turned out that the first idea I received really was the right portal for her, and the second idea will grace the 2/3 door sitting in our garage since last April. Once I had the quote, I figured this portal would practically paint itself, and I so looked forward to completing it during the week of Imbolc. The subtle shift of mid-winter as it tips towards spring, the inspiration of Brigid, and the long-awaited completion of my creative space next door all seemed to align into their own opening to the next phase. As happened before, though, various other alignments presented themselves for deeper discernment and even more perfect timing. An unexpected guest we could not easily refuse decided to assert use of the blue house (my newly finished and long anticipated creative space), and her presence and the non-communication of when I would or would not have the house to myself encouraged me to put off the painting for one more week. 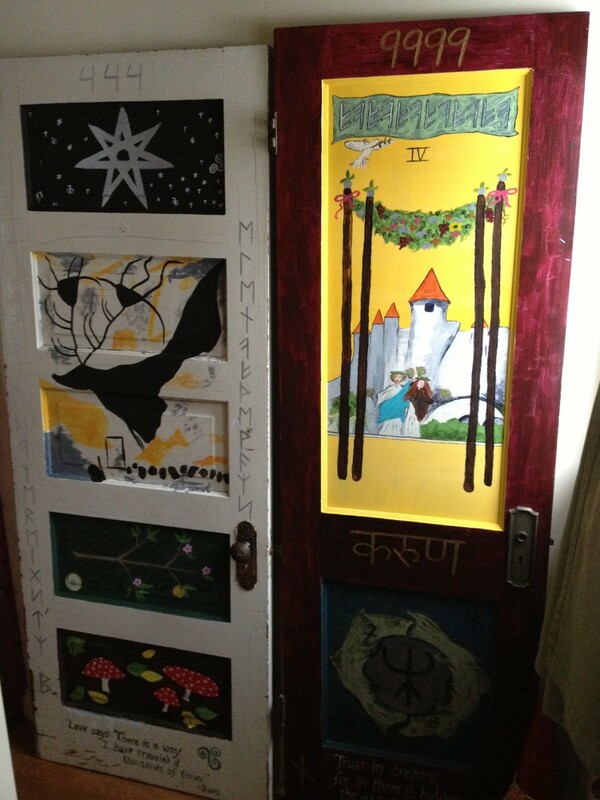 When painting portals, you want to feel in the right mind and heart set, lest you accidentally open the door to energies or outcomes other than the sacred intention. I felt rather frustrated at yet another delay, but the timing of that Imbolc week — which stretched from our Imbolc Wheel of the Year gathering on Saturday, January 30th all the way through the (quite late) actual cross quarter day of February 4th — turned out to offer exceptionally magical openings, blessings and shifts. I added a Reiki Healing Attunement to the portal door process and awaited the following week. I added ivy to the tree to symbolize intertwined friendships, sychronicities and spirals throughout life, and how, even as things change, a part of them remains eternal. May the “Peace of the Blue Irises” gently usher in those soul longings for greater harmony and connection. May the babbling brook and stone path lead to your own magical doorway, and may this door open to quiet worlds of wonder. 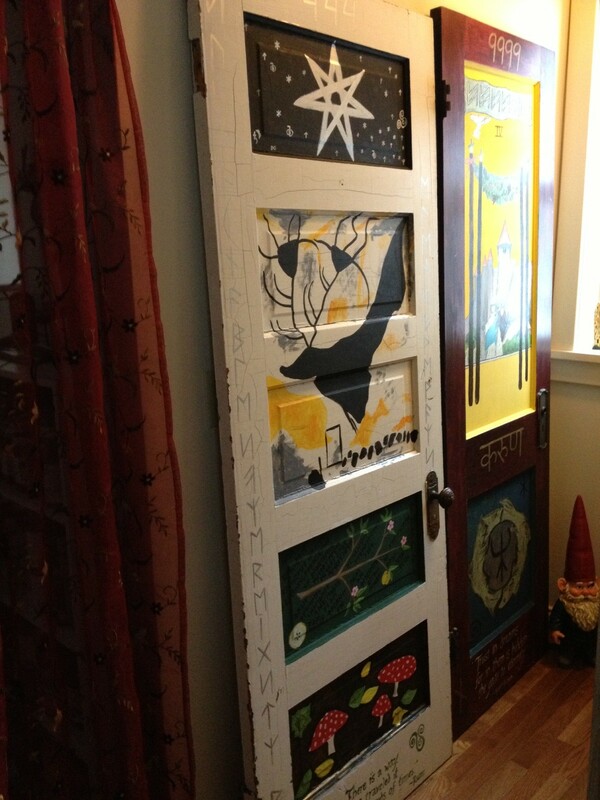 For the past three “doors,” I’ve taken to canvases that portray some sort of doorway or entry point — still portals, but not painted on actual doors. I usually select a local or personal issue as the initial point of need or emotional spark, but then I create the portals as offerings for how such issues play out across the world. 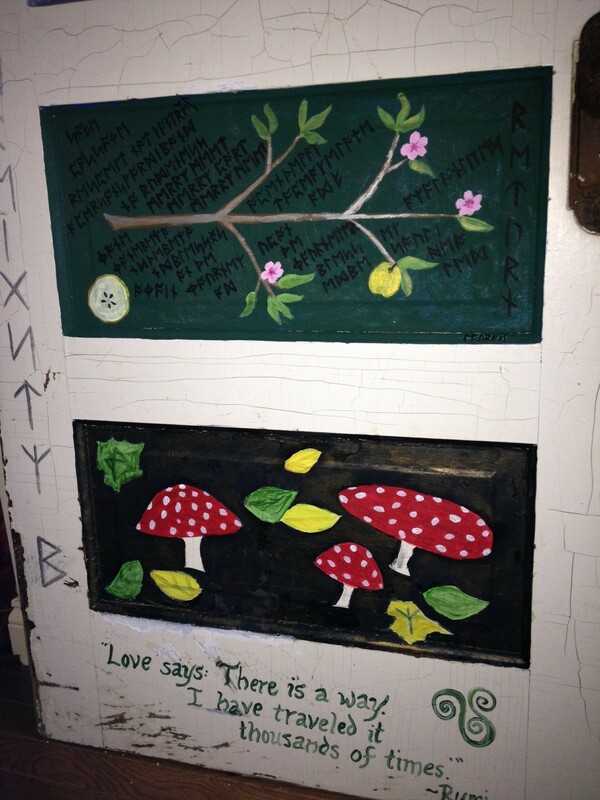 “As Within, So Without,” and “As Above, So Below.” I’ve painted portals for healing Lyme Disease, for welcoming a return of the Divine Feminine and the Divine Masculine, along with commissioned doors to support inner transformation and healing. Given the theme of protecting both Nature and human rights, I felt called to old goddess traditions that connect the ideas of “Sovereignty” and “the Land.” In Celtic, Norse, Native American and other traditions, the health of the land reflects our inner state or the state of a community’s leader. The awful condition of our world reflects the psychopathic leaders and corporations we have allowed to usurp the natural goodness of the human race. We have, collectively, lost our way. Elen’s connection with birch trees appealed to me, because this old, white door with all its cracks and chipped paint reminded me of a birch tree. David agreed that I should leave the door as natural as possible in order to invoke the traditional newness, fertility and rebirth associations with birch trees and the Berkano Rune. I also liked that the Berkano Rune looks like a pointy capital B, appropriate for creating a Plan B to the predetermined Plan A(genda 21). 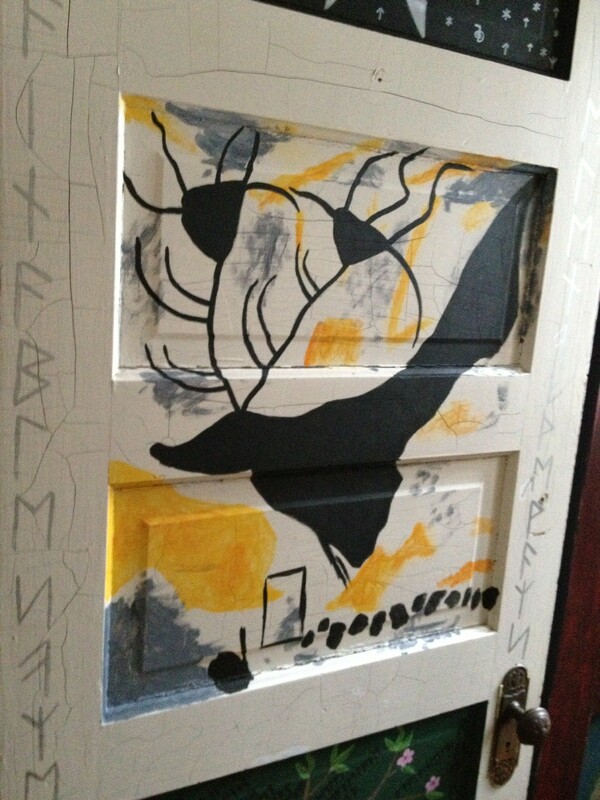 I painted this entire door during the first Mercury Retrograde period of 2014, because Mercury Retrograde supports revision, reworking, and wriggling out of former contracts. Merc Rx introduces a certain degree of chaos, which can thwart new initiatives, but offers great energy for tweaking old ones. Since Agenda 21 came about in 1992 and our town had already been selected as a pilot city for an APA implementation of A21, creating a Plan B through alternate ways, seemed highly suited for a Merc Rx project. I live in a world of synchronicity, but even I was floored when I found myself painting the portal address of 444 at exactly 4:44 East Coast US time on February 6, 2014 — the exact moment when this Mercury Retrograde period began! 444 reminds us of the angels’ love and support, and I’ve certainly felt them during this process. 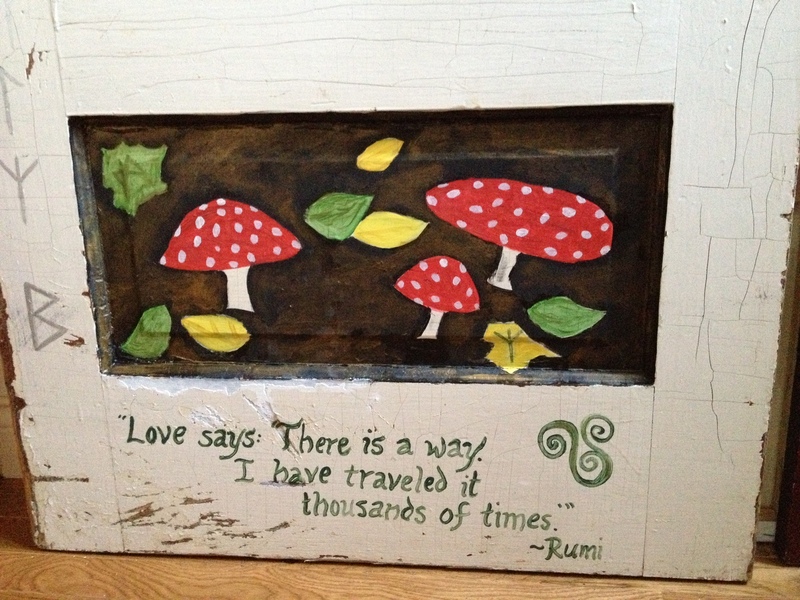 In addition to the inscribed intention, “Love said, ‘There is a way. I have traveled it thousands of times,” I also wrote in silver runes down the left side: “SUSTAINABLE SOVEREIGNTY,” a concept that honors and connects both human rights and a healing of Nature. I had some interesting conversations with various members of the Faery Realm while creating this portal. Agenda 21 aims to remove humans from most of the land and huddle them into megacities with a Wetlands Project that keeps vast stretches of Nature off limits to all but a self-proclaimed elite. Part of me wondered if the faeries might prefer such an arrangement, given how irresponsibly humanity has treated the planet. It turns out that, although some of the Faery Realm does despise humanity, significant portions recognize a joint destiny between the realms. The Faery Rule, “Respect, Not Control,” urges humans to respect Nature but does not support the sort of top-down police state regulations of advanced Agenda 21. The Faery Realm representatives I’ve long worked with prefer voluntary communion with humans and the natural world — a cooperative honoring and regeneration of the land as sacred. The most ancient concept of regenerating the land remains totally entwined with the idea of sovereignty. The Fae also indicated that vibration from such intense misery of human enslavement, along with the electromagnetic monitoring of all off-limits areas, would make our planet even more intolerable for such sensitive beings than it already is. By contrast, voluntary communion with the land and between the realms offers a truly healing and celebratory opening into a preferred reality with much more cooperation and exchange among the realms. You can see that I’ve used Runa Faery coding — one of three different systems of Runes used on this portal — to express compassionate intentions and requests for the Highest Good of All, not just human centric, yet also not excluding humanity from that mix.